With the close of 2011, Quantum Day wishes each and everyone of you a great and prosperous 2012! Enjoy this last entry of the year! Champagne is a sparkling wine produced by inducing the in-bottle secondary fermentation of the wine to effect carbonation. The term "Champagne" is used to refer to wine produced exclusively within the Champagne region of France. The primary grapes used in the production of Champagne are Pinot noir, Chardonnay and Pinot Meunier. Champagne is very much identified with momentous celebrations such as sports victories, weddings and anniversaries and of course, New Year's Eve. More champagne corks are popped on New Year's Eve than any other day in the year. 2011 is the International Year of Chemistry. And to mark the end of this momentous year, The American Chemical Society posted a video on the science and chemistry of champagne. 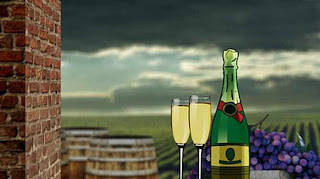 The video explains that champagne, unlike other wines, undergoes a second fermentation in the bottle to trap carbon dioxide gas, which dissolves into the wine and forms the fabled bubbles in the bubbly. More than 600 different chemical compounds join carbon dioxide in champagne, each lending its own unique quality to the aroma and flavor of champagne. But even with all of that flavor, champagne would be just another white wine without those tiny bubbles. As the bubbles ascend the length of a glass in tiny trains, they drag along molecules of those 600 flavor and aroma substances. They literally explode out of the surface as the bubbles burst, tickling the nose and stimulating the senses. Some accounts say that a French Benedictine monk named Dom Pierre Pérignon discovered champagne in the mid-1600s, and became namesake for the famous champagne cuvée, Dom Pérignon. The video points out that early champagne makers had a tough time with that second fermentation. Some bottles wound up with no bubbles at all. Others got too much carbon dioxide, and exploded under the enormous pressure, wasting the precious vintage. So what's the best way to pour a glass of bubbly and maximize the sensory experience? For an answer, the video turns to a study published in the Journal of Agricultural and Food Chemistry, one of more than 40 peer-reviewed scientific journals published by the ACS. Pouring champagne on an angle retains up to twice as much carbon dioxide in the champagne when compared to pouring down the middle of the glass. Those additional bubbles carry out more of the hundreds of flavor compounds in champagne.